Embrace boundaries and learn to live in the moment. Give up my phone addiction. Cultivate a life of joy, gratitude, and peace, not of fear, negativity, and comparison. When I picked up the book Hands Free Life: 9 Habits for Overcoming Distraction, Living Better, & Loving More by Rachel Macy Stafford, I kind of thought it would be a book about putting down the phone (and other screens) in an effort to pay attention to who or what is right in front of you. And that it was. But it was so, so much more. This book was one that I picked up back in January but had a hard time getting through because it was not what I expected it to be. I don't mean that in a negative way at all, because it was exactly the message I needed when I finally had the time to really read it and receive the lessons Rachel doled out so beautifully and humbly with her well-written words. Rachel writes so honestly as she shares her "Hands Free Journey" that involves so much more than giving herself boundaries with technology in an effort to be more present with her family. In her book, she describes how attempting to control everything her life was not only driving her crazy and leading her to a deep sense of discontentment, but it was also affecting her children's well-being and her relationship with her spouse. As a recovering people pleaser who has stereotypical eldest child syndrome, Rachel's words deeply resonated with me. She explained how she went from wanting everything in her life to be perfect and easy, with no problems and a pretty exterior that others envied or at least admired, to someone who wanted to serve others, take risks, and be the best she could be for her kids- all while being humbly human. 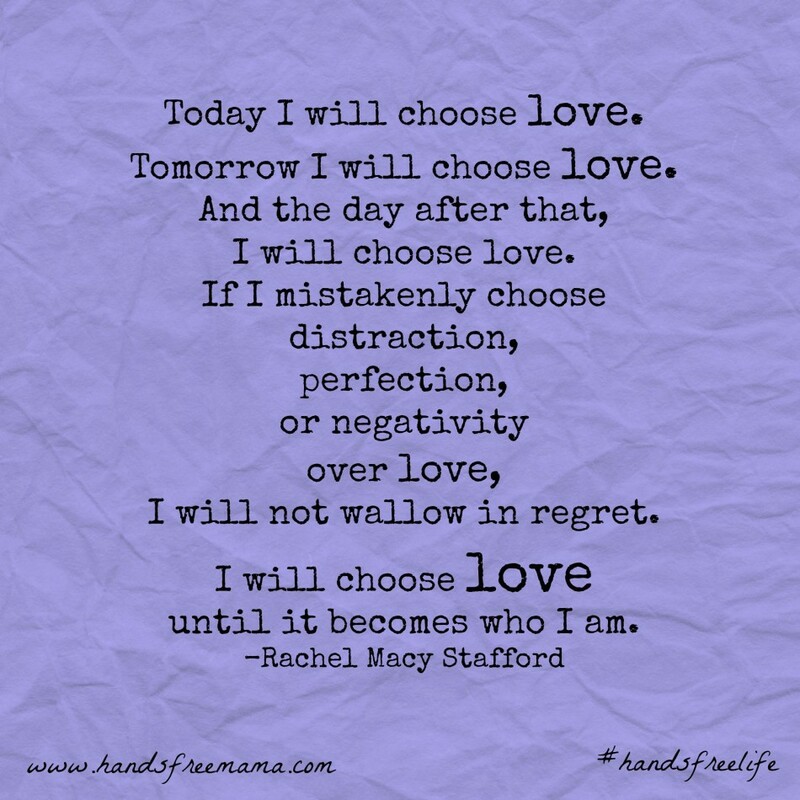 One thing that has stuck with me is Rachel's mantra of "Only love today." When I am tempted to get stuck in negative thinking, anger, comparison, etc, I have repeated those three little words to myself, which has allowed me to focus on where I truly need to devote my mental energy. There were so many parts of this book that I know I will reference when I have children, because she explains so well how to be a present, loving, and encouraging parent who enables your child not only to succeed, but to thrive and be a good human. I underlined so many things and had tears in my eyes and was challenged and encouraged by Rachel's conviction to live for what really matters. If that sounds like something you're into, then I highly recommend you pick up a copy and discover the power of Hands Free living.